Purchase of the 2016 Code in PDF and/or Softbound includes a NFPA 72 PDF with Changes indicated. State-of-the-art coverage in the 2016, NFPA 72®, National Fire Alarm and Signaling Code® reflects new technologies and applications. The traditional role of fire alarm systems is rapidly evolving. Now, the benchmark for fire alarm systems has changed to give designers, engineers, contractors, installers, and inspectors rules that reflect the current state of the field. An industry milestone, the 2016 edition of NFPA 72, National Fire Alarm and Signaling Code has the most advanced provisions ever developed for the application, installation, location, performance, and inspection, testing, and maintenance of fire alarm and emergency communications systems -- including Mass Notification Systems (MNS). Interested in previous editions of NFPA 72? Find them here. NFPA 72®: National Fire Alarm and Signaling Code evolves to help you save lives with fire detection, signaling, and emergency communications systems that function as intended. NFPA 72 provides requirements for the design, application, installation, performance, testing, and maintenance of protective signaling systems and their components. The Code was expanded and renamed for the 2010 edition to include requirements for Mass Notification Systems (MNS) used for weather emergencies; terrorist events; biological, chemical, and nuclear emergencies; and other threats. Fire protection engineers, designers, installers, contractors, maintainers, electricians, Authorities Having Jurisdiction (AHJs), manufacturers, facilities operators, and anyone involved with fire alarm or emergency communications needs NFPA 72 to work confidently with these life-saving early warning systems. The 2013 NFPA 72: National Fire Alarm and Signaling Code features significant revisions that clarify fire alarm and emergency communications systems rules and enhance usability. New Chapter 7 consolidates all documentation provisions into one location, helping Code users and AHJs improve efficiency and save time. Other major changes include a reorganized inspection table with specific inspection methods; a new testing table that merges two previous tables into one -- with both test methods and frequencies side by side for improved usability; revised supervising station transmission methods; and new requirements for audible and visible occupant notification. The 2010 NFPA 72: National Fire Alarm and Signaling Code presents the most extensive change to the Code since the 1993 edition, with a new scope and revised organization. Besides the core focus on fire alarm systems, this edition adds requirements for Mass Notification Systems (MNS) used for weather emergencies; terrorist events; biological, chemical, and nuclear emergencies; and other threats. 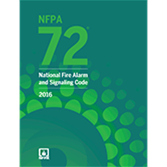 NFPA 72's broader coverage is reflected in a new Code title. In addition to updating rules for in-building fire emergency voice/alarm communication systems, a new Emergency Communications System chapter addresses in-building and wide-area MNSs. The 2007 NFPA 72: National Fire Alarm Code presents technology- and research-driven changes that offer improved egress time and system reliability. A new Mass Notification Systems Annex developed at the request of the U.S. Air Force provides guidelines to facilitate fast, safe evacuation in emergency situations such as fire, terrorist attack, biological and hazardous chemical incidents, accidents, and natural disasters. Added requirements for new technology equipment include new rules for video image smoke and flame detection, detectors that use multiple sensing inputs, fire extinguisher monitors, and directional appliances. The 2002 NFPA 72: National Fire Alarm Code offers comprehensive requirements to support your work with the design, application, installation, performance, testing, and maintenance of protective signaling systems and their components. This edition provides additional coverage of performance-based detection and visible signaling systems, and new requirements for integrating fire alarm systems with other building systems. The 1999 NFPA 72: National Fire Alarm Code is a trusted guide to the design, installation, maintenance, testing, and use of fire alarm systems. Separate groupings for system inputs, systems outputs, system functions, and general requirements enhance the Code's user-friendly design. This edition of NFPA 72 introduces a new requirement to synchronize the temporal-three standard evacuation signal within a notification zone, increased audibility requirements for emergency voice/alarm communications systems, and qualification requirements for fire alarm systems designers. Find previous editions of NFPA 72 here.